CLR-IES-L320 layer-3 full Gigabit industrial Ethernet switch is embedded with 4*Gigabit SFP slots and 16*10/100/1000Base-T ports in industrial communications providing advanced performance. It integrates Layer 2+ switching features such as VLAN/multicast/QoS/Ring with Layer 3 features such as static/dynamic routing, multicast routing, and supports a user friendly web console interface for easy configuration as well. CLR-IES-L320 Industrial L3 switch supports IEEE 802.3/802.3u with 10/100/1000M, full/half-duplex, MDI/MDI-X auto-sensing to provide an economical solution for your industrial Ethernet network. 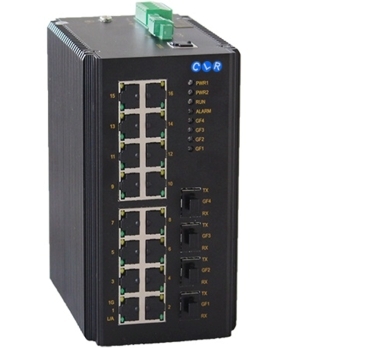 In addition, the switch can work in the harsh industrial electromagnetic environments for industrial Ethernet devices, over long distances via optical fiber and anti-electromagnetic interference with communications, suitable for different regions with various temperature levels. CLR-IES-L320 provides a convenient, robust and reliable way for networking industrial control systems. It can satisfy customers requirements for long distance, high speed transmissions.